Here is the answer to the question of whether you can use variegated yarns for illusion knitting. The two yarns used in this shawl were quite close to each other in colour. Although one was predominantly browns and greys and the other mainly pinks, each had areas of the other colour. We concluded that when your brain is able to perceive a repeating pattern it will see the complete design even though there are areas when the honeycomb and the background are merged together. This is also an adventurous use of mitred triangles. 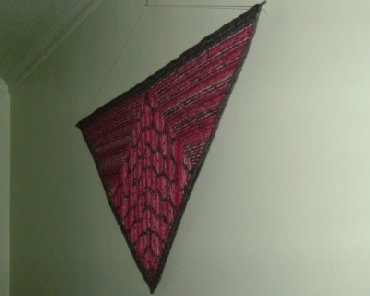 The shawl is made, in one piece, from two mitred triangles. The design is symmetrical about the centre line and the mitre lines. The shawl looks different from every angle. Sometimes you only see stripes.